On Thursday, Dec. 13, the community celebrated the opening ceremony of the newly completed Safer Path Family Violence Shelter, formerly the Atascosa Family Crisis Center, with a reception and guided tours. Williamson and staff were looking forward to a special and much needed milestone, with the facility slated to open in January as a residential shelter. However, the recent federal government shutdown has stopped the grant payments vital to Safer Path’s daily operations. Not only is it unknown when the residential shelter will be able to open, but now the facility will have to reduce its services. 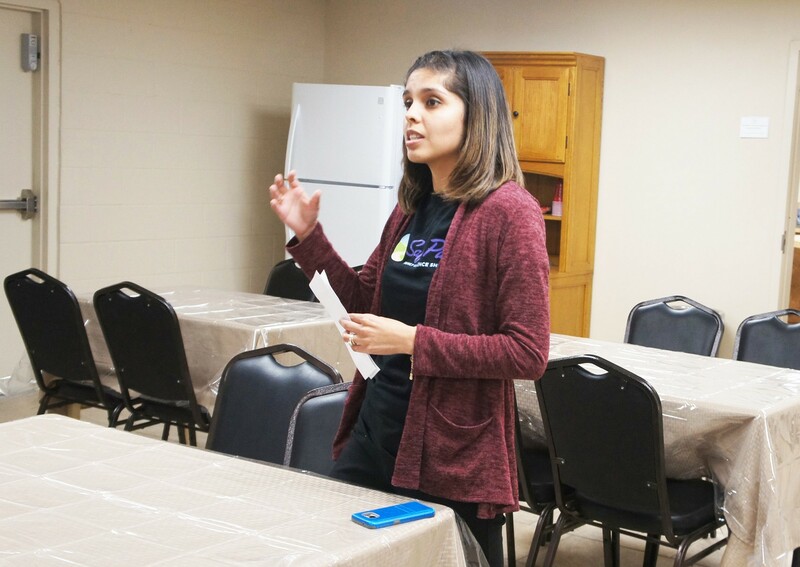 Safer Path Crisis Advocate Adrianne Mendez describes some of the features of the kitchen area at the shelter. Williamson explained they have already gone through what little cash reserve they had preparing for the shelter, under the assumption that they were going to get reimbursed for that money because it was in their grant budget. The shelter will run full-time through the end of January. Then they will go down to 75 percent Feb. 1. They will go down to 50 percent after Feb. 15, and then hold at that 50 percent status until Williamson hears something, or until they completely run out of money. Their top priorities remain keeping the hotline going, so that they can do immediate crisis intervention and safety planning with victims, as well as their existing caseload that is coming in. Williamson said they may have to move to a waiting list for the first time in the agency’s history. On average, statistics show a victim tries to leave an abusive relationship seven times before she or he walks out. When a person decides to leave, that is the most dangerous time for them, because the abuser often picks up on it. “We’re calling creditors and the people we owe money to and asking, can you float us? Here is where we are. We’re trying to free up as much money as we can to pay staff as long as we can. I’ve got staff that are willing to work without pay. I’m trying to find the forms and legality around that, so that they get paid when this gets done. It’s heartbreaking,” Williamson said. She added they are even looking at selling property they were counting on as an administration building and an education center. They are in need of getting some cash reserves and the situation is serious. Since Williamson is hearing so many conflicting stories, it is difficult to know what to believe. Safer Path advocates Cindy Rodriguez and Imelda Gomez share details to the tour group, following the ceremony and dinner reception on Dec. 13. Just like the clients Safer Path serves, the agency is operating paycheck to paycheck. After Jan. 15, Williamson is working without pay. 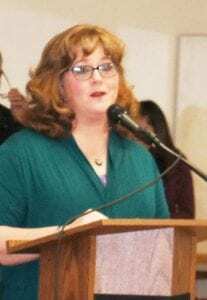 Safer Path Executive Board president Susan Phillips has served in that position since September and been involved with the center for six years. “These girls do an incredible job. I ran EMS for many years and I dealt with many victims of domestic abuse, from beatings to sexual assault. I saw that side of it, so when I was asked to be on the board I thought, well this is a good opportunity to try and help. I wanted to help get things in a more service type area, and we have finally done that with, hopefully being able to open the shelter soon,” Phillips said. Williamson’s interview on Monday was a significant change from only a week and a half before, when Williamson met with the Pleasanton Express, eagerly anticipating how close they were to finally operating as a residential shelter. Safer Path staff transported clients Christmas Eve in the middle of the night and on Christmas Day. 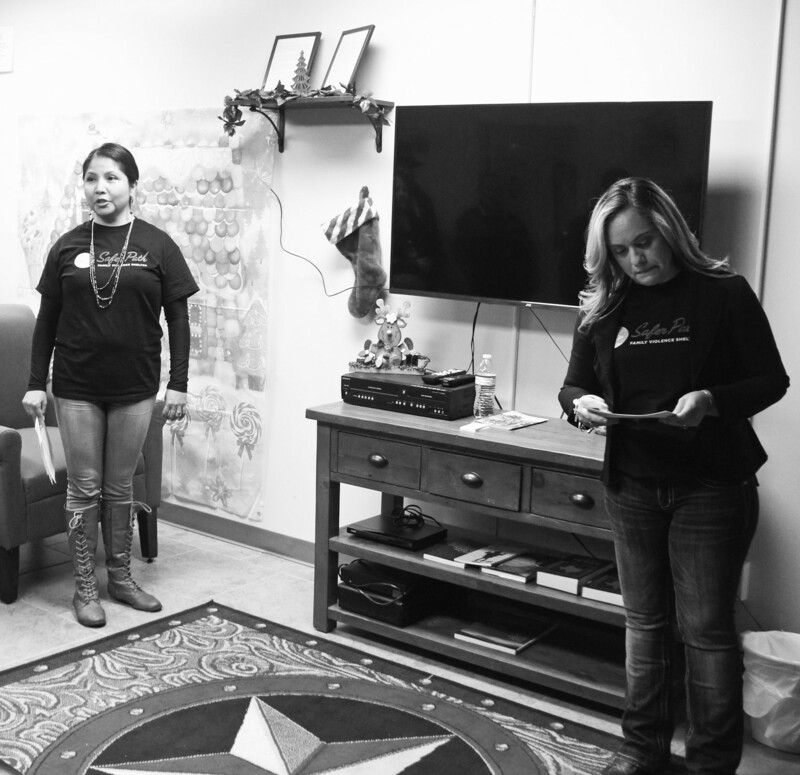 Safer Path was founded as the Atascosa Family Crisis Center in 1992. While local hotels have been good to the center, a hotel is not designed for the safety needs of somebody who is fleeing domestic violence, noted Williamson. The staff is still closing out the year’s statistics and filing reports, so they are not all in. However, Williamson said in 2017, they spent 125 hours transporting clients out of the center. Williamson said she needed to focus on the fact that it took awhile to get the funding and a good plan in place. “We know it’s done right. Everything is done up to code. Everything is done up to standard. We’re trying to make this as safe as possible. We’re moving at light speed, compared to how we’ve been moving,” Williamson said. Her background includes serving as the primary prevention and education manager for the Women’s Shelter of Corpus Christi, which is now the Purple Door, as they went through a rebrand just like Safer Path did. She researched the prevention of domestic violence and abuse and learned that one has to work with youth early on and be frank and up front. She did that for four years, until she devoted more time to caring for a loved one due to illness. Her family has lived in the Atascosa County area for almost eight years. When she no longer commuted to San Antonio, she learned more about her neighbors, her community and local events. She found out about the crisis center through an article in the Pleasanton Express about a bake sale and car wash fundraiser. She knew she wanted to help. Mark Pawlik of Southlan Homes, based in Jourdanton, is the builder of the project. Pawlik started the project close to two years ago. “We got it done, so they ended up with a completely new building. We had a lot of asbestos removed, but got it all taken out. Now they don’t have to worry about anything. We put in all new units, new electrical wire. Their roof wasn’t the best, but now they have a new roof,” said Pawlik. He was glad to be part of such a worthwhile project. The residential shelter houses eight bedrooms and every bedroom sleeps at least two people. Most of them can sleep threefour. Shelters can be a difficult place to live in long term, since residents are already leaving a tense situation and are already on edge. So the shelter’s bedrooms house private closets. The courtyard area is going to be the main point of entry and exit for staff and clients that live there. There are picnic tables, a playground and activities for kids to do in that area. Then there’s also a quiet outdoor space for adults who don’t have kids or don’t like kids. “We are also creating something called a quiet room. There’s not a TV in there, there’s not a radio in there. Lights are kept low. Furniture is comfortable and it is designed to be a space to go and collect your thoughts and read, or journal,” Williamson said. Williamson has cried along the way as construction was completed, as she recalled how the project began as what was supposed to be a simple bathroom remodel. Williamson shared how when The Refuge Atascosa Pregnancy Care Center closed, they gave Safer Path their facility. The plan was that the old Refuge building would house Safer Path staff who serve in administration. It would allow for them not to compromise anybody’s safety, or privacy or confidentiality. They would also be able to hold meetings there and educational sessions, like the domestic violence classes and parenting classes CPS orders to non-offending parents so that they learn better skill sets. Currently, clients have to drive to San Antonio for such classes. An administration building would also allow for supervised visitation and programs like BIPP, which is the Battering Intervention and Prevention Program. It is a 10-12 week curriculum, peer to peer based, that reteaches relationship skills. Safer Path still has the mortgage to pay off. She still needs dog kennels for victims who will not leave without their dog or cat. Henry Dominguez is going to help with that in the short term by housing pets at the new county animal shelter. One of Safer Path’s big annual fundraisers is HeartStrings for Hope in the fall. Plans are in the works for a competitive shoot in May. This past December’s Adopt-A-Family Program was a huge success, in which businesses and individuals donated toys and other items to families. Safer Path thanks everyone who gave from their heart. Last fiscal year, Safer Path had 2,154 hotline calls. Fifty-six percent of their clients are under the age of 18 because of the number of children they are seeing. 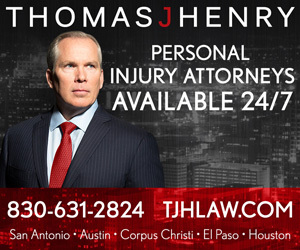 Other stats: 68 percent of their clients are female, 61 percent are Hispanic and 93 percent come from Atascosa County. Advocacy and crisis intervention is the top service Safer Path provides. That is followed by legal advocacy. Other services are counseling and transportation. “We used to be Atascosa Family Crisis Center. Crisis centers around the country have come to mean organizations that help with a variety of crises. We serve victims of domestic violence and sexual assault. That is what we are trained for. That is what we are experts on. That is what we are able to provide resources and support for,” said Williamson. Williamson said she, the board and the staff are struck by what their clients are able to achieve with an advocate in their corner. Since their tagline has always been, “Helping families walk a safer path,” it seemed fitting to call the center Safer Path. The new logo is positive, bright and hopeful. “So here it is very clear that what we’re doing makes a difference. We’re seeing the numbers increase every year. This lets me know that our outreach coordinator Shawnene and you guys are helping us get the word out. People are hearing about us who need to hear about us. There’s movement there and you see that happen,” Williamson said. A GoFundMe account has been established to raise funds for Safer Path. Please also read Williamson’s Op-Ed piece in this week’s issue.